1. Preheat the oven to 200ºC, gas mark 6. Cook the potatoes in boiling water for 7 minutes until just tender. Drain and place in the base of an ovenproof serving dish. 2. Meanwhile, heat the oil in a small frying pan and fry the salad onions for 1-2 minutes. Add the oats and oatmeal and fry for 2 minutes. Add 60ml water and seasoning, and stir until just absorbed. Press onto the mackerel and place on top of the potatoes. Bake for 15-20 minutes. 3. Meanwhile, place the watercress and ricotta in a food processor and blitz to give a coarse paste. 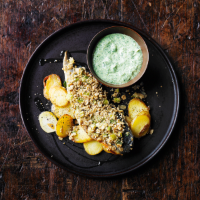 Serve with the oat-topped mackerel and potatoes.